Composite Lining Systems has qualified Field Service Representatives (FSR's) available to supervise the installation of GlassBore® and GlassWrap® tubing and casing. The excellent protection provided by the GlassBore® lining system requires proper installation of the compression ring. The CLS Tech will install the C-ring into the coupling and observe the process of making up the connection. He is available to make necessary recommendations to the crew to accommodate special situations (thread wear, inconsistent standoff, etc). Before the joint is tripped into the well, the FSR will drift the connection as a final added assurance against over-compression of the ring. 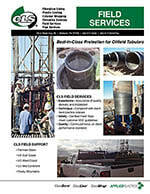 CLS Field Service Representatives are also available to supervise the installation of GlassWrap® externally wrapped tubing and casing. The FSR will repair incidental damage to the external wrap caused by tongs, elevators or slips as the string is tripped into the well. Exposed bare metal at the joint is eliminated with the addition of epoxy-wetted material applied across the connection. Composite Lining Systems enthusiastically recommends inviting a qualified CLS Field Service Representative to your drilling or workover location.